“Education is our passport to the future, for tomorrow belongs only to the people who prepare for it today.“- Malcolm X. It can be difficult to educate ourselves on the work done by other graduate students with limited time. I took the time to learn something new by looking at the research of a few of our GSDS members. I hope that in reading this article you will also learn a little bit about a broad array of superb work done by Clayton, Juan Carlos, Emre, and Wennie. Clayton Cozzan is a Ph.D. candidate in the Materials Department working in Ram Seshadri’s group. He has been a very active member of GSDS serving on the Marketing Committee (2014-2016), as Recruitment Chair (2014), Reception Chair (2015), and Scheduling Chair (2016). Clayton studies thermally stable phosphors for their application in high power white lighting. On the left is sample phosphor and the right is sample excited remotely by a near UV laser diode (in plane of view). Blue light emitting diodes (LEDs) were first made by Herbert Paul Maruska and co-workers. These devices were not bright enough for commercial applications. Subsequent research by Amano and Akasaki as well as methods developed independently by Moustakas and Nakamura enabled the production of high brightness blue LEDs. Akasaki, Amano, and Nakamura were awarded the 2014 Nobel Prize in Physics for the invention of the first high brightness blue LED. When combined with inorganic phosphors contained in silicone, part of the blue emission can be downconverted to longer wavelength light, producing other colors of the spectrum that mix to create white. Ultimately, a simple combination of a blue LED with a yellow emitting phosphor results in efficiently produced white light.1 Laser diodes (LDs) are the high power improvement to LEDs. The high intensity light generated by them requires new structures that allows the phosphors to conduct heat efficiently to avoid damage and minimize loses in efficiency.2 Clayton’s work is exciting because he was able to greatly reduce both preparation time and self-heating damage associated with phosphors in silicone traditionally used for LEDs. 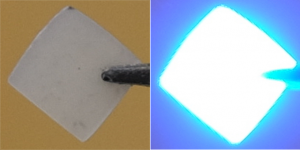 This work is also the first demonstration of a thermally stable blue phosphor morphology. Juan Carlos Villaseñor Derbez is a MESM (Master of Environmental Science and Management) at the Bren School of Environmental Science and Management. As a Latin American Fisheries Fellow, his graduate studies are focused in Coastal Marine Resources Management. Juan Carlos became a GSDS member in 2016 after attending the GSDS Fall Social in the Bren Courtyard. Unsustainable fisheries were described as a tragedy of the commons in 1968 by Hardin.3 Unregulated use of a common resource in a society where quantity directly corresponds to profit undoubtedly leads to depletion and ultimately destruction of that resource. However, regulating/managing fisheries is complicated, requiring a balancing act between environmental and socioeconomic goals for sustainability.4 Almost 15 years ago, Pauly argued that harvest control methods for fisheries must also be accompanied by conservation in the form of no-take reserves in marine protected areas.5 Juan Carlos’ work with his group, TURFeffect, led to the creation of a guidebook for the evaluation of no-take marine reserves in Mexico. 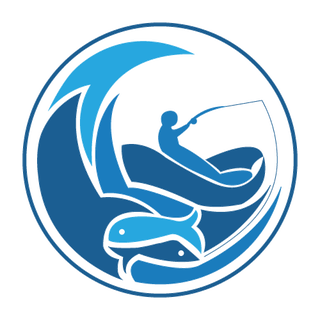 Juan Carlos and TURFeffect also created an app called the Marine Reserve Evaluation Application (MAREA) which provides a facile way to evaluate the biological and socioeconomic objectives of no-take reserves. You can read more about it on the project’s official website turfeffect.org or Juan Carlos’ ResearchGate profile. Emre Discekici is a Ph.D. candidate in the Chemistry Department working jointly in Javier Read de Alaniz and Craig Hawker’s groups. Emre has been a member of the Marketing Committee (2014-2015), Scheduling Chair (2015), and currently serves as the director for the GSDS DOW Distinguished Lecture Series. In this work, Emre and coworkers developed a highly efficient and facile polymerization protocol using light for semi-fluorinated polymers in collaboration with the groups of Professors Christopher Bates and Thomas Davis. This should create opportunities across a breadth of fields that exploit fluorine-containing materials for bulk, interfacial, and solution applications. 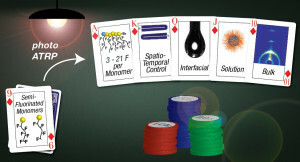 Below is a modified TOC graphic exhibiting one of Emre’s favorite pastimes, poker. Fluoropolymers are among some of the most thermally and chemically resistant polymers. Some of these polymers are household names like Teflon, which was created and patented by Roy Plunkett at DuPont in the late 1930s/early 1940s. In addition to non-stick surfaces, fluorinated and semi-fluorinated polymers have a broad range of applications. Conventional techniques for the synthesis of semi-fluorinated polymers are limited and Emre’s work sought to develop a method to alleviate these limitations.6 Using ultraviolet light (360 nm) induced atom transfer radical polymerization they can synthesize semi-fluorinated acrylate and methacrylate polymers with incredible control. This work opens the door to novel well-defined fluorine containing polymers with potential utilization in lubricants, surfactants, coatings, and even drug delivery. Defects. How many of us have them? Wennie Wang is a Ph.D. candidate in the Materials Department in the Van de Walle Computational Group. Wennie has served as our fearless leader for the past year. She’s shown a passion for outreach while in GSDS, serving as Outreach Director (2015) and Scheduling Chair on the Outreach Committee (2014). Electrochromic materials, like tungsten trioxide (WO3), undergo reversible color changes because of an external electrochemical stimulus. For many transition metal and rare earth oxides, oxygen vacancies (defects) are thought to play a crucial role in their properties.7 Like many observed phenomena in the sciences the exact mechanism for WO3 electrochromism is currently still disputed.8 Wennie’s work utilizes hybrid density functional theory to understand two things (1) what defects do to the structure and electron density of WO3 and (2) how they lead to the resulting electronic properties. The graphic below is an example of the level of detail possible to observe with first-principles calculation methods. Electron charge density associated with one possible oxygen vacancy configuration in a semiconductor supercell, (a) before, where the density is localized around the defect and (b) after atomic relaxation, where the density has spread out. I hope you enjoyed this introduction to the work of some of our GSDS members. I hope you stay curious, read more, and ask questions. (1) George, N. C.; Denault, K. A.; Seshadri, R. Phosphors for Solid-State White Lighting. Annu. Rev. Mater. Res. 2013, 43 (1), 481–501 DOI: 10.1146/annurev-matsci-073012-125702. (2) Cozzan, C.; Brady, M. J.; Dea, N. O.; Levin, E. E.; Nakamura, S.; Denbaars, S. P.; Seshadri, R. Monolithic translucent BaMgAl10O17 : Eu lighting phosphors for laser-driven solid state lighting. AIP Adv. 2016, 6 (105005) DOI: 10.1063/1.4964925. (3) Hardin, G. Tragedy of the Commons. Science 1968, 162 (3859), 1243–1248 DOI: 10.1126/science.162.3859.1243. (4) Liu, O. R.; Thomas, L. R.; Clemence, M.; Fujita, R.; Kritzer, J. P.; McDonald, G.; Szuwalski, C. An Evaluation of Harvest Control Methods for Fishery Management. Rev. Fish. Sci. Aquac. 2016, 24 (3), 244–263 DOI: 10.1080/23308249.2016.1161002. (5) Pauly, D.; Christensen, V.; Guénette, S.; Pitcher, T. J.; Sumaila, U. R.; Walters, C. J.; Watson, R.; Zeller, D. Towards sustainability in world fisheries. Nature 2002, 418 (6898), 689–695 DOI: 10.1038/nature01017. (6) Discekici, E. H.; Anastasaki, A.; Kaminker, R.; Willenbacher, J.; Truong, N. P.; Fleischmann, C.; Oschmann, B.; Lunn, D. J.; Read de Alaniz, J.; Davis, T. P.; et al. Light-Mediated Atom Transfer Radical Polymerization of Semi-Fluorinated (Meth)acrylates: Facile Access to Functional Materials. J. Am. Chem. Soc. 2017, jacs.7b01694 DOI: 10.1021/jacs.7b01694. (7) Ganduglia-Pirovano, M. V.; Hofmann, A.; Sauer, J. Oxygen vacancies in transition metal and rare earth oxides: Current state of understanding and remaining challenges. Surf. Sci. Rep. 2007, 62 (6), 219–270 DOI: 10.1016/j.surfrep.2007.03.002. (8) Wang, W.; Janotti, A.; Van de Walle, C. G. Role of oxygen vacancies in crystalline WO 3. J. Mater. Chem. C 2016, 4 (27), 6641–6648 DOI: 10.1039/C6TC01643J.